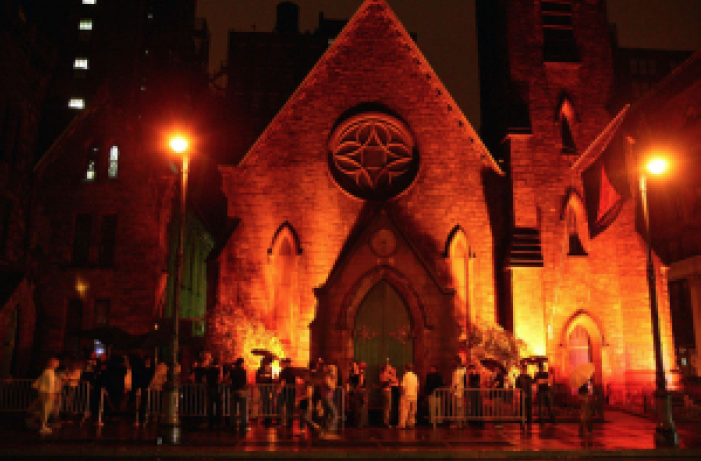 Having exorcised the hedonistic Limelight nightclub’s drugged out demons, the former Episcopal church at 656 Avenue of the Americas is set to become a branch of exercise chain David Barton Gym. Rumors that DBG was cruising the Chelsea location have circulated for months, but the gym has confirmed the news on its Facebook page. And The Commercial Observer has learned that Scott Edlitz, a retail specialist who joined Colliers International just last month, brokered the 19,000-square-foot deal on behalf of the tenant. Daniel Iwanicki represented the landlord, Ashkenazy Acquisition Corporation, in-house. The new location will open next fall. “It was a very complicated deal,” said Mr. Edlitz, who began working on the transaction about a year ago when he was a broker at NAI Global NYC. “There aren’t many retail real estate brokers who could do this sort of transaction.” He added that the multilevel DBG will not take up the entire building and that the corner space is still available. The property has had a rocky past since the infamous Limelight fell victim to predictable internal disarray and Rudy Giuliani‘s war against nightlife in 1997. It briefly housed the forgettable Avalon dance club and, in 2010, went retail with the ill-fated Limelight Marketplace, a collection of shops and food vendors. Despite expanding to Las Vegas, Miami, Chicago and, recently, Greenwich Street–where it replaced a Crunch–DBG has weathered its share of storms. The company filed for Chapter 11 shortly after the 2009 opening of a 33,000-square-foot Astor Place location in 2009. Following a debt restructuring, its buff namesake founder left the company earlier this year (by choice, according to a New York Magazine article). Mr. Barton opened the first of his eponymous gyms in 1992 at 15th Street and Avenue of Americas, just blocks from the future Chelsea flagship. The chain helped establish a new fitness center formula that combined workouts, disco decadence and a good deal of Chelsea boy-on-boy ogling. He was previously married to evergreen club kid doyenne Susanne Bartsch. The 656 Avenue of the Americas gym will replace the current Chelsea location at 215 West 23rd Street when it closes in the coming weeks.